Last week, the 10-year US treasury bond rate dropped to 1.75%. While it has risen since to about 2%, there can be no denying a basic fact. Government bond rates have dropped in almost all of the developed market currencies: the Euro, the British Pound, the Swiss Franc and the Yen. Since government bond rates are used as risk free rates to estimate discount rates in valuation or hurdle rates in corporate finance, there has been a great deal of hand wringing and angst among valuation practitioners on the consequences. In fact, if you allow for the increase in sovereign risk across the globe, you could argue that the "true" risk free rates are even lower than the already low government bond rates. In my previous post on the sovereign rating downgrade for the US, I noted that the default spread would have to be netted out against the government bond rate to get to the risk free rate. If, for instance, you accepted the S&P rating of AA+ for the US and estimated a default spread of 0.20% for that rating, the US dollar risk free rate right now would be about 1.80% (2% minus 0.20%). So what effect do lower risk free rates have on value? The answer, if you follow conventional valuation practice, seems obvious. Lower risk free rates, holding all else constant, result in lower discount rates, and lower discount rates, all else held the same, will result in higher value. In fact, this seems to be the implicit message in the Fed's Operation Twist 2: that lower risk free rates are good for the economy and markets. It is also this facile conclusion that makes some practitioners uncomfortable with using today's rates in valuations; the angst gets deeper when the practitioner in question wants a "low" value for an asset (for tax assessments or to tilt the scales in a legal tussle). It is not surprising then that these practitioners flirt with an alternative: why not use "normalized" risk free rates instead of today's "abnormally" low risk free rates? 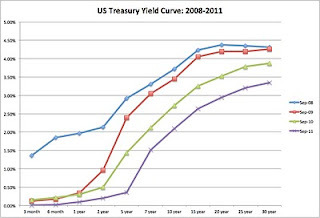 The normalized risk free rates are generally computed by looking at the past: thus, the average 10-year treasury bond rate over the last 30 years, which is closer to 4%, is suggested as an option. Alluring though this option seems, not only is it the wrong solution to the perceived problem (of low risk free rates and out of control valuations), there may be no problem to solve in the first place. And here is why..
1. 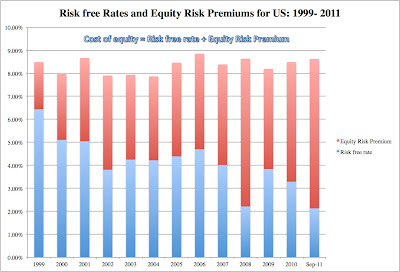 The risk free rate is not just a number in a discount rate computation but an opportunity cost. One way to think about the risk free rate is that it is the rate you will earn if you choose not to take the risky investments that are out there (stocks, corporate bonds, real estate, a business venture). So, let's carry this to its logical extreme. Let's assume that you do replace today's risk free rate (2% or lower) with your normalized rate (4%) and that the resulting high discount rate gives you a low value for your risky asset. Let's then assume that you choose not to invest in that risky asset. Where do you plan to invest that money instead? In your normalized bond earning 4%? Since it exists only on your spreadsheet, I am afraid that you will have to settle for that "abnormally" low 2% interest rate. 2. The risk free rate is a reflection of what people expect in the overall economy for the foreseeable future. Harking back to an equation that I have used before, note that the risk free rate is the sum of two market expectations: an expectation of inflation for the future and an expectation of real growth. Viewed through these lens, it is quite clear that a very low risk free rate is not generally compatible with a vibrant high growth economy. In fact, the biggest factor driving down ten-year bond rates this year from 3.29% to 2% has been the increasing pessimism about global economic health, pushing down both expected real growth and expected inflation. That is the basis for my argument that the Fed has become a side player in this game and that its push for lower risk free rates is actually at odds with its desire that the US return to healthy economic growth. The effect on value will be greater for higher risk companies, where the risk premium is magnified, and lower for lower risk companies, but it will be significant across the board. Note that the first scenario resembles the market numbers in 2007 whereas the second is close to where we are today. The shift in risk free rates/ risk premiums may explain why stocks look cheap today, relative to historic metrics. You will find everything you look at to be dramatically under valued, but the model is internally inconsistent. In effect, though, you are combining a crisis risk free rate with a good times risk premium/growth rate to estimate too high a value. Here, the inconsistency is that you have combined a good times risk free rate with a crisis risk premium/growth rate to estimate too low a value. 3. The denial valuation:You could be a normalizer, replacing current numbers with normal numbers, not just on the risk free rate but on the other inputs (equity risk premiums, cash flows, growth rates) as well. This faith in mean reversion leaves the intrinsic value of the hypothetical company stuck at $2,600 million, as risk free rates and risk premiums change, and views the crisis as "nightmare" that will soon be forgotten. Unlike the first two choices, this one is internally consistent and may, in fact, be the valuation that is used by a classic contrarian investor, who believes that markets over react and adjust back to norms over time. 4. The dynamic valuation: You could use today's combination of a low risk free rate, high risk premium and low nominal growth to estimate a value of $1,700 million for the company. The valuation is internally consistent but the downside is that it will be volatile and change as the macro environment changes, creating discomfort for those who believe that intrinsic value is a stable number that stays unchanged over time. I would steer away from the internally inconsistent valuations, either dysfunctional (giving you too high a number) or depressed (giving you too low a number) because your inputs are at war with each other. As for denial and dynamic valuations, I prefer dynamic valuations because I am not sanguine that reversion back to historic norms will happen soon. I can see why long term, value investors may be attracted to denial valuations but they better have a road map to their alternate pre-crisis universe, or the valuations will not come to fruition. But the bottom line about risk free rates is worth repeating. Lower risk free rates do not always translate into higher values for risky assets and it is not necessarily a "problem" that needs to be solved. We are in the midst of a "rogue trading" scandal and the media loves it. It started with this report in the Wall Street Journal about an unnamed trader who had lost $ 2 billion for the Swiss banking giant, UBS. The trader was quickly identified and named as Kewku Abodoli, a director at the UBS Delta One desk (more on that later). Today's story has more details, with a comment from Abodoli's lawyer about how much he regrets his actions (or at least getting caught). If you have a sense of deja vu, it is because you have seen this story play out before. Just to refresh your memory, here are some memorable rogue traders from times past, with one being famous enough (Nick Leeson) that he had a movie (and not a very good one) made about him. Rogue trading is trading by an individual, that violates his or her employer's norms and rules on investing and risk taking, exposing the entity to catastrophic risk. Note that rogue trading does not require "losses" to qualify. A rogue trader can take "catastrophic risks" and make millions or lose millions. Only the latter join the gallery of rogue traders, tarred and feathered by the media, and forced to do the perp walk. What about the rogue traders who make money? They are richly rewarded, celebrated as master traders and generally leave to start their own hedge funds. Enough said! Why is there rogue trading? Trading is addictive: Anyone who has traded knows that the process can be addictive, where trades lead to more trades, and at least for some people, there is no stopping the trading. House money and Breakeven effects: In an earlier post on Jerome Kerviel, I noted that two well documented tendencies in behavioral finance: the tendency to take more risk than you should with other people's or house money and the proclivity to reckless risk taking, once you start losing money, to get back to break even. As you look across the rogue trading episodes, they all share this characteristic. These traders all started with small losses, which they tried to recover from with bigger bets, and the process kept escalating until you get to hundreds of millions of dollars. How do rogue traders generate these losses and how do they get away with it? When we read about the magnitude of the losses that are generated by rogue traders, we are faced with two questions: How do you lose hundreds of millions of dollars? How is it possible to do so undetected? Buy on borrowed money: You can borrow immense amounts of money on a small capital base, especially if you work at a large bank, and invest the amount in risky assets. You increase the upside on your equity investment, if you are right, but you magnify the downside, if you are wrong. Derivatives: You can make bets on derivatives that have potentially unlimited losses: this is the case when you buy or sell a futures contract on a commodity or a currency or when you sell options (either calls or puts). Long-short strategies: You can sell short on some risky assets, collect the proceeds and buy other risky assets, i.e., the hedge fund strategy. If the asset prices move in the right direction (your short sold assets have to drop in value while your long assets have to increase in value), you can make dramatic returns on small investments. However, if asset prices move in the wrong direction, your losses can be many times your equity investment. Coming back to Kewku Abodoli, the rogue trader of the moment, it is worth noting that he traded on the "Delta One" desk. On the surface, Delta One desks are relatively placid and profitable places, where traders trade derivatives and exchange traded funds (ETFs) to take advantage of movements in the underlying assets (the delta in the desk name references the option delta, i.e., the percentage change in the option value for a unit change in the stock price). However, access to derivatives and ETFs can be a double edged sword, allowing a rogue trader to take very large risk exposures. Time lags in risk measurement/management systems: Given how quickly prices move in financial markets, there can be time lags in marking investments to market and learning about risk exposures. These problems are exacerbated with ETFs, since they are themselves often portfolios of traded assets which have to be marked to market. Systematic measurement error in risk management systems: All risk management systems are based upon risk measures that are estimates. Thus, Value at Risk (VAR), a widely used risk measure at banks, has measurement error on many of its inputs, and some of these errors are systematic. For instance, a VAR that is based upon the assumption that asset prices move in a normal distribution will understate the risks of assets whose prices are discontinuous and tend to jump. Traders that learn about these systematic errors can then exploit them to hide real risks in their portfolios. Avoidance and Denial: It is possible that those who monitor the rogue trader get a sense that something is wrong much earlier than the final denouement. However, in a very human response, the first response is to deny that a problem exists and avoid it, until it blows up. How can you stop rogue trading? Hire the right traders: In my post on Jerome Kerviel, I pointed to the folly of entrusting trading to young men, a group that tends to take bigger and more reckless risks than any other subgroup of the population. I also suggested, only half in jest, that investment banks hire a few traders' mothers to trade alongside the traders, since older women are the perfect counterweight to young men in risk taking. I am sure that Mr. Abodoli would have been more cautious in his risk taking, if his mother had been sitting at the next desk. Real time and dynamic risk measurement systems: Risk management systems should track prices in real time and capture bad risk exposures early. Restrict trading in illiquid assets: Even the most sophisticated risk management investments have trouble dealing with assets that are illiquid, where the prices are appraised values and not transaction values. As investing choices widen from traded stocks and corporate bonds to ETFs, derivatives and mortgage backed securities, risk management systems have come under more strain. Simple and focused risk management systems: Since inputs into risk measurement and management systems have systematic measurement error that traders exploit, simpler risk management systems that have fewer bells and whistles are more difficult to game. In addition, investment banks can borrow a technique that El Al, the Israeli airline, has used for years to keep terrorists off their planes. Rather than spreading their resources wide and check every passenger, they profile passengers and focus on those most likely to create problems. Banks can adopt a similar practice: rather than have risk management systems that track every trade in the bank, they can identify those areas, where rules are most likely to be broken and focus attention on them. Stress testing: Every risk management system will fail. It is a question of when, not whether. The key to good risk management is how you respond to failures in the system, not successes. Rather than assume that everyone is playing by the rules and measuring the consequences, it makes more sense to assume that some will not play by the rules and prepare for the consequences. Look at outcome and process, not just outcome: I started this post by noting that rogue traders who make millions are feted and celebrated. As long as we continue to do that, we will incite traders to take unconscionable risks. The best way to bring home the point that you will not put up with rogue trading is to fire a rogue trader who makes millions and to deny him his bonus. Investors in these banks: By the same token, investors in banks have to be cognizant of the risks that come with proprietary trading. A bank that generates a higher proportion of its profits from proprietary trading is riskier, other things held equal, than a bank that generates its revenues from traditional banking. If these banks trade at the same multiple of earnings, I would pick the latter over the former. In practical terms, I am suggesting that when screening for bargains among banks, we look at the percentage of profits from proprietary trading as a risk measure. Regulatory authorities: If rogue trading is part and parcel of proprietary trading, then it follows that institutions where the government provides a backstop should not be allowed to indulge in it. This is the basis for the Volcker rule in the US and the new banking rules that are being discussed in the UK, both of which would bar commercial banks from proprietary trading. I agree. At the start of this week, President Obama laid the groundwork for his deficit plan, with one of the proposals being what he termed the "Buffett" tax. Like Bank of America, a few weeks prior, he was perhaps hoping to borrow on Buffett's credibility to increase support for his plan. Put briefly, here is the what the plan is designed to do. Taxpayers who earn more than a million dollars will be required to pay at least as high a tax rate as what the average tax payer pays. What constitutes a average taxpayer (I guess it is a good thing that it is not the median taxpayer; since that would comprise an income tax cut for millionaires, not a tax increase) and how high this "alternative" tax rate should be has been left to Congress to specify. It is sanctimonious: The word that best comes to my mind as I read Buffett's views on investing and business is "sanctimonious". He is the noble CEO, who puts stockholders' interests first, in a world full of cynical, self interested CEOs. He is the keeper of the value investing flame, while those short-term money managers in New York and London have abandoned Ben Graham, fundamentals and first principles. He is the brilliant financial thinker, standing alone against those clueless academics and their betas & option pricing models. In his latest foray, he is the "good" billionaire, who wants to pay his fair share of taxes, unlike those bad ones who shirk paying their share. This tax plan echoes this refrain. In effect, it says, the details don't matter because the intentions are noble: the rich can not only afford to pay more in taxes but they should be happy to do so. It is hypocritical: All this sanctimony might be tolerable if it came from someone who not only talks the talk but walks the walk. Warren Buffett is a hypocrite on many of the issues that he is most vocal on. Consider corporate governance. The same man who said that managers are stewards of their shareholder capital has not always followed his lead, in structuring and running his own company. First, Berkshire Hathaway has adopted the dual-voting share plan that has been the weapon of choice for entrenched insider control in other companies (See New York Times, News Corp, Google, Washington Post... ). Second, while I admire Buffett's frugality, I don't see any transparency at Berkshire Hathaway. In fact, it looks to me like the board at the company exists to rubber stamp whatever Buffett and Munger want. A case in point: look at the successors that have been hired to take Buffett's place: Ted Wechsler (his recent hire) and Todd Combs. Both seem like nice men with, but we know little about them (other than the fact that Buffett and Munger like them). One of the few data points we have on Wechsler is that he was the winning bidder, two years in a row, paying $2.6 million each year, in an auction where the prize was lunch with the Oracle from Omaha. If you see nothing wrong with that, you should be okay with Bob Iger picking his successor for Disney from a Mickey Mouse look-alike contest or Steve Ballmer choosing the next winner of the hot dog eating contest at Coney Island (Was that Joey Chestnut?) as the CEO for Microsoft. Third, for those who argue that Buffett can be trusted to make these judgments, I do remember that he did hand-pick his last successor and that did not end well, did it? No one is impervious from making mistakes, but people who live in glass houses should not throw stones. This tax proposal is just as hypocritical. While it is couched in terms of fairness, it is based on a false argument: that millionaires pay less in taxes because they exploit massive tax loopholes and have very good tax lawyers. While there may be some who do, we know why the effective tax rate for millionaires is so low. It is because a significant portion of the income comes from capital gains and dividends, which are paid out by corporations from after-tax income, and taxed at a lower rate than ordinary income (from wages and profits). I would have had much more respect for the proposal if it had directly confronted this issue. Should investment income be taxed at a lower rate? Should we be taxing consumption or income? That would be a debate worth having. It is superficial: To be honest, there is really no tax proposal, because the key details of the proposal, the "average" tax payer and the "millionaire minimum tax rate" are not specified. That is very much in keeping with the Buffett rule book. I know that much has been made about the brilliance and home-spun wisdom of Buffett's aphorisms. But as I read the letters that he has written to his stockholders (which comprise the heart of his writing), I am left with the feeling that when Buffett wanders from his preferred habitat - talking about investing in and managing mature companies - there is less there than meets the eye, especially when it relates to macro and market issues. What seems profound and wise at the first reading seems less so with each subsequent reading. Put differently, when it comes to a great deal of investing wisdom, Buffett's sayings seem to draw more on the fortune cookie tradition than from Confucius. As far as this tax proposal goes, it looks like it was conceived by a union of a rogue economist and an over-the-top populist. (Perhaps, it was.. Has anyone seen Robert Reich and Paul Begala hanging out together?) It will, without a doubt, make the tax code more complex. As a taxpayer who has had to deal with the effect of capped itemized deductions and the alternative minimum tax rate (AMT) for the last decade, I think that they rank among the worst tax code abominations ever, and this proposal is more of the same, just directed at millionaires. It will also be ineffective. The administration estimates that it will raise $ 400 billion in tax revenues from the Buffett tax, which strikes me as unlikely. First, since the "millionaire tax rate" is unspecified, the fact that they can estimate revenues from it reveals exceptional brilliance. Second, since much of the income that will be taxed comes from dividends/price appreciation in the stock market, it would require a rising market and healthy economy. Kraft Foods: Kraft Foods split itself into two companies: a division that sells candy and snacks (Oreo, Cadbury, Tang) globally and a division that sells grocery brands in the US (Oscar Meyer, Jell-O). McGraw-Hill: The company responded to demands by investors that it break itself up by dividing itself into two businesses: McGraw-Hill Markets, which includes the S&P rating and index businesses and McGraw-Hill Education, composed of the publishing and education businesses owned by McGraw-Hill. Netflix: Reed Hastings, the CEO of Netflix stated that the company would separate its DVD rental business (and give it the name Qwikster) from its streaming-only service (which will continue to be called Netflix). Tyco: Tyco announced its intention to break itself up into three separate companies: a residential security business (ADT), a unit selling valves and controls to energy, mining and water markets and a commercial fire and security business. This represents the closing salvo in a multi-year effort by Tyco to deconglomeratize (I know.. I know.. there is no such word... but there should be) itself. What happens in a break up? Control of the management of the business(es), where the effect can range from a complete separation of control (with each of the broken up businesses becoming independent companies, completely delinked from the parent company) to de facto serf status for the separated units (with the parent company exercising complete or near complete control over the separated businesses). 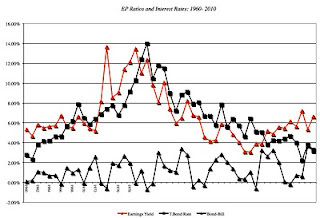 Market pricing of the units, where the effect can range from the broken up businesses trading as independent units (with their own shares, market price and traded value) to no change in the status quo, with the parent company trading as a single company, composed as a holding company for the separated business units. A break up can have tax implications for the investors in the parent company. To the degree that a break up can be viewed as a transition from owning stock in one consolidated company to owning shares in multiple companies, tax authorities may assess capital gains taxes (relative to what was originally paid for the stock) or treat distributions as dividends (and tax them accordingly). Again, in the continuum, you can have break ups that create no tax consequences for investors and break ups that create large tax bills. The good news is that the details of the break up ultimately have to be made public to investors, who can then assess the control, pricing and tax implications. The bad news is that the details may not be accessible at the time of the initial announcement of the break up. Does breaking up make sense? Contaminated Parts: One division of a company may be saddled with actual, perceived or potential liabilities that are so large that they drag down the valuations of the rest of the company. This was the rationale for tobacco companies, faced with potential billion-dollar payouts on lawsuits brought by smokers, spinning of their non-tobacco businesses (See, for instance, the Kraft spin off from Altria (Philip Morris) in 2007). In the same vein, a company with a heavily regulated or constrained subsidiary may find that the regulations and constraints on that subsidiary spill over into its other businesses, rendering them less profitable. If restrictions on commercial banking are tightened (think of Dodd-Frank, with teeth...), it is conceivable that the large money center banks may want to spin off their investment banking arms to operate independently. The efficiency story: In the 1960s and 1970s, imperial CEOs (Like Julius Caesar, they brooked no dissent and looked to no one for advice) like Harold Geneen (ITT) and Charles Bludhorn (Gulf and Western) built up companies that spanned multiple businesses, arguing (with lots of help from strategists and consultants) that conglomerates would have significant advantages over their smaller competitors. Studies over the last three decades suggests that this optimism was misplaced and that conglomerates are often less efficient than competitors, earning lower returns and profit margins. In fact, markets responded by "discounting" conglomerates by about 5-15%, to reflect the inefficiencies. If conglomerates are less well run than the competition, perhaps because managers are spread too thin across business or because there is cross subsidization, then breaking them up into their individual businesses should increase efficiency, profits and value. The break up of Tyco, a company built on the conglomerate premise (and accounting gamesmanship), over the last decade can be a case study in deconglomeration. The simplicity story: Multi-business companies are not only more difficult to manage but they are also more difficult to value. With companies like GE and United Technologies, different businesses within each company can have very different risk, cash flow and growth characteristics and coming up with a consolidated number can be cumbersome. In my book, the Dark Side of Valuation, I examine why valuing their "octopus" companies is so difficult (you can just download the paper... you don't have to buy the book..) and how to do a true sum of the parts valuation. In good times, investors may overlook the complexities of valuation, trust the managers and value these multi business companies highly. In bad times, they will not be as charitable and will punish complex companies by discounting their value. Breaking up the companies in bite size pieces that are easier to value and trade may therefore increase value, especially if you are in a "crisis" market. The tax story: When tax codes are complex (and when are they not? ), companies may be able to lower their tax bills by artfully breaking themselves up. For instance, let us assume that the US government decides to take the populists' advice and tax all income generated by US corporations, anywhere in the world, at the US corporate tax rate in the year in which the income is generated (rather than when it is repatriated back to the US, as is the current law). Multinationals like GE and Coca Cola that generate a significant portion of their taxes in foreign locales, with lower tax rates, will be able to lower their tax bill by breaking up into independent domestic (US) and international entities, with different stockholders, managers and corporate governance structures. Loss of economies of scale: Combining businesses into a company can create cost savings. Thus, a group of consumer product businesses may benefit from being consolidated into one unit, with shared advertising and distribution costs. Breaking up with result in a loss of these savings. Reduced access to capital (and higher cost): If external capital markets (stock and bond) are undeveloped or under stress, combining businesses into a consolidated company can provide access to capital. How? The excess cash flows from cash rich businesses can be used to finance reinvestment needs in cash poor businesses. Lost synergies: I am generally a skeptic about synergy but it does exist. In some multi-business companies, businesses feed off each other's successes, thus making the whole greater than the sum of its parts. Disney is a good example, especially in its kid-oriented products: its movie business generates opportunities for its licensing businesses and increases revenues at its theme parks. Separating Disney into independent movie, toy and theme park businesses will result in a loss of these benefits. If companies were rational, they would be looking at this trade off and making judgments on whether to break up, based upon the net effect. A rational explanation for the surge in break ups is that we are in a market phase, where risk is front and center, and complexity is being punished. By focusing on sensible reasons for breaking up firms, we do miss the most important factor that explains corporate actions: herd behavior. Investment banks, consultants and corporations often get stuck on the same page in the value creation cookbook and dole out the same advice for each company that comes looking for help at a point in time. Break ups may be the flavor of the moment, and companies are jumping on the bandwagon, expecting stock prices to go up, even if the break up makes no economic sense. a. Past performance: I know.. I know.. I have read the disclaimers too, but if you are performing well (both in terms of earnings and stock prices), why mess with a winning formula? A firm that is performing well (both in terms of profitability and stock price measures) should therefore be less inclined to consider breaking up than a firm that is under performing its competition. b. Separate and independent businesses: The benefits of breaking up increase and the costs decrease if the businesses that are being broken up are stand alone, independent businesses, with few or no cross business links. Conversely, companies with interlocked businesses that have synergies should be wary of break up plans. c. Management rationale and consistent actions: A break-up is more likely to succeed if the managers of the parent company are clear about their objectives and structure the break up consistently. For instance, if the rationale for a break up of a company is that one business is contaminating the remaining businesses, the break up makes sense only if it creates separate legal entities that operate independently. So, how do the break ups in the news measure up? The Tyco break up makes the most sense: the businesses are separate and independent and managers seem clear on the rationale. It is also part of a long term plan and is not a knee-jerk response to market developments. The Netflix break up seems like a clumsy solution to a pricing problem: the cost of maintaining a DVD customer is higher than the cost of a streaming customer and that cost difference will widen as fewer people use DVDs. But do you have to break up a company to accomplish this? I am at a loss on the Kraft break-up. The businesses that are being divided have more in common than they are different. Oreo, Cadbury, Jell-O and Oscar Meyer are all strong brand names with a global presence. The fact that the latter two may get more of their revenues from US grocery story sales does not strike me as a big difference. Perhaps, there are differences in growth prospects, but the costs of breaking up (lost economies of scale and synergies) seem to vastly outweigh the benefits. In short, this break up seems to fit into "action is better than inaction" rationale for break ups. Time Warner: Time Warner is a company with tentacles in every aspect of entertainment. Unlike Disney, which does get significant cross business synergies, Time Warner has less overlap across businesses. The company has had trouble on both profitability and stock performance measures and a management that will never outlive the consequences of having made the worst acquisition in history. GE: In the days of Jack Welch, GE was a case study of a large company that seemed to have found the fountain of everlasting growth. Not only have we discovered in hindsight that this growth (mostly from acquisitions) was more expensive than it seemed at the outset, but GE Capital has taken on an outsized role in determining the value of GE as a company. As one of the largest financial service companies in the world, with its own share of costly mistakes, GE Capital is an impediment to valuing GE and an brake on its stock price. Unlike other captive financing arms (Ford Capital, GMAC), where the bulk of the revenues come from within the company and separation is difficult, GE Capital derives a significant portion of its revenues outside GE and should be easier to separate from the company. Citigroup/Bank of America/ JPM Chase: The strategies that the big money center banks embarked on, a decade or more ago, of being financial supermarkets, with business interests in banking, real estate, portfolio management and housing finance has blown up in their faces. Instead of the diversification helping the company, one or two portions of each bank (with bad lending practices or toxic assets) is threatening to bring down the rest of the institution. Perhaps, it is time to break up.. or in the case of Bank of America, put one of its businesses into bankruptcy.. So, embark on your proactive exercise of looking for potential break up candidates: if you can get ahead of the curve, you should profit, even if only a fraction of these companies do break up. Just to help you along, I have attached a very simple spreadsheet for assessing the effect on value of a break up, in both intrinsic and relative valuation terms. Have fun with it! Since the banking crisis of 2008, neither fiscal nor monetary policy has proved up to the task of rejuvenating the US economy. The Federal Reserve, in particular, has explored almost every tool in its arsenal to increase economic growth. In 2009, there was Quantitative Easing II (QE II), where an influx of $ 600 billion was used to buy long-term bonds and lower long term interest rates. Those lower rates, it was argued, would help get housing back on track and increase real economic growth. At the time, I argued (though I admitted my limited credentials to be involved in this debate) that I did not think it would work, for the simple reason that interest rates were already low, with the 10-year T. Bond rate at 3.3%. Two years later, the 10-year T. Bond rate stands at 2.09% and treasury bill rates are close to zero. The Fed is now planning to get back into the game with a maneuver that it has last tried in 1961: Operation Twist. Simply put, here is what the Fed hopes to do. Rather than introduce more funds into the system (like QE2 did), Operation Twist is a shift in what securities the Fed invests in, rather than how much. The Fed, which holds about $1.7 trillion of US treasuries is planning of reducing its purchases of short term treasuries (1 month, 3 month etc.) and increasing its holdings of long term treasuries (10 years and higher). Assuming that the rest of the market stays in a holding pattern, the increased demand for long term bonds should lower those rates, while the rate for the short term notes and bills will increase. The “interest rate” story goes as follows. There are a number of key consumer (mortgage financing) and corporate interest rates (corporate bonds, long term bank loans) that are tied to the long term rate. In its optimistic version, for consumers, QE3 will reduce the rates on mortgages, inducing those staying on the sidelines to either borrow and buy a new house or to refinance an existing house at the lower rate, with the savings going into consumption. Companies, it is argued, will also be more likely to borrow more, if corporate bond rates decrease, and make new capital investments. The “confidence” story is based upon the presumption that both producers and consumers in the United States prefer a Fed that acts to one that does not. Since QE3 would qualify as action, both groups, it is argued, will become more inclined to invest, consume and take risks. The valuation story builds on the first two. Here is what the optimistic take is: a lower long term rate will trump higher short term rates, pushing discount rates down. The higher real growth, coming from the interest rate story, and lower risk premiums, emanating from the confidence story, will then augment this impact, causing stock prices to increase even more. For the interest rate story to work, long-term interest rates have to go down significantly without short term rates shooting up too much. 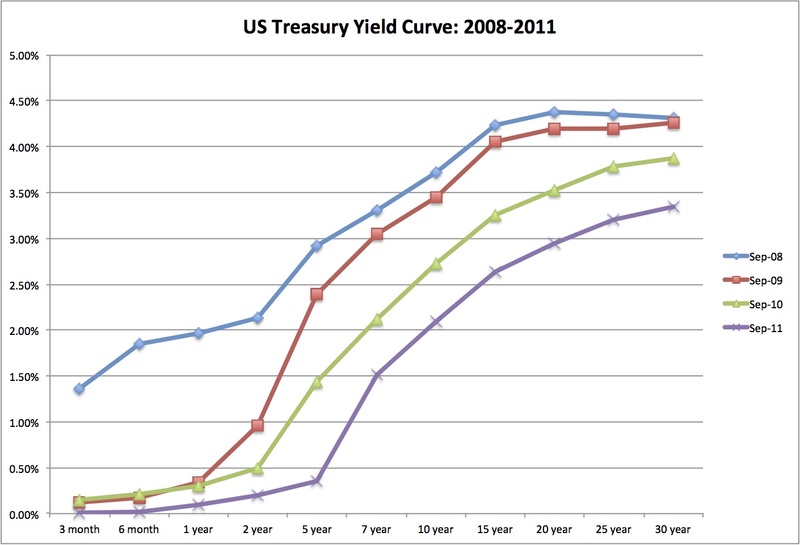 In the figure below, I have the yield curve in September 2011. If the 10-year bond rate is at 2%, how much lower can it go? Even the optimists at the Fed seem to foresee a drop of about 20 basis points as the outcome and no one seems to have an estimate on the concurrent increase in short term rates. Since mortgage rates are already at historic lows, I don’t see a further drop of 0.20% making much difference. I don’t buy the confidence story, simply because I don’t think action always trumps inaction. In fact, my reaction to hearing that the Fed was trying to twist the yield curve is that they must be scraping the bottom of the barrel, if this is the best that they can do. How would I read this? 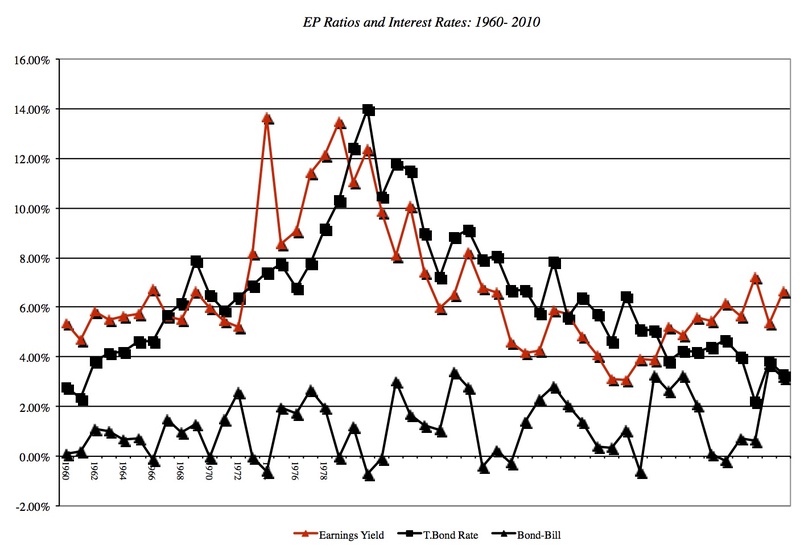 At least between 1960 and 2010, every 1% increase in the long term bond rate increases the EP rate by 0.67% and every 1% increase in the slope of the yield curve decreases the EP ratio by 0.31%. The EP ratio for the S&P 500 right now is about 6.97%, based upon a trailing PE of 14.34. Assume that the best case scenario unfolds and that long term rates drop by 0.20% and that short term rates increase by 0.20%. By my estimates, the EP ratio for the S&P 500 will remain almost unchanged at 6.96%, resulting in the trailing PE of 14.36. Thus, stock prices will not change by much as a result of this action. Perhaps, long term rates will drop by more and/or short term rates will rise less. You can download the spreadsheet that I used for my computation and input your best estimates: this spreadsheet has four worksheets: the raw data on the index and fundamentals, the chart of the historical EP ratios, the regression output (backing the regression above) and a prediction worksheet (where you can estimate the effect on stock prices). Have a go at it! As for myself, I will stick with my favored version of the twist. As some of you probably already know, I teach at the Stern School of Business at NYU. Well, summer is officially over and a new semester is beginning. In a rite that I repeat at the start of every semester that I teach, I want to invite you to be part of my class this semester. Note, though, that this invitation is completely unofficial and approaching NYU for credit for taking the class is a definite no no. The only class that I will be teaching this fall is Valuation. A little history, though it may bore you, is in order here. I came to NYU in 1986 and the very first class that I was asked to teach was a Security Analysis course, a class with deep and venerable roots (Ben Graham taught this class at Columbia and Warren Buffett took it in the 1950s). It was a class on valuing securities of all types, bonds, futures, options and stocks, but it had outlived its useful life by the mid 1980s, partly because there were other electives that focused on bonds and derivatives and partly because there was no narrative left that fit the class. I hijacked the class, revamped its content (without renaming it), and made it a semester-long class on valuing businesses: small and large, public and privately owned, growth and mature and developed and emerging markets. About 4 years ago, the administration recognized the obvious and changed the name of the class to reflect its content. While the class is centered around intrinsic valuation (or discounted cash flow valuation, if you prefer to use its applied form), and I am a firm believer that intrinsic value matters, I try (though I do not always succeed) to keep an open mind and not force feed my views. Consequently, you will hear me talk a lot about the limitations of discounted cash flow valuation and what I see as its dark side. In addition, a significant portion of the class is devoted to multiples and comparables (what I term relative valuation), since it is the dominant approach used by analysts to value companies. I do also bring in the role that option pricing has played in valuation, in the form of real options. Thus, I try to make this class as broad as possible in terms of approaches covered and businesses valued.. My objective is that you should be able to value any asset or business, using any approach, and from any perspective (investor, acquirer, appraiser), by the end of this class. What background do I need to take the class? This class is an elective that is taken primarily by second year MBAs, most of whom have had the misfortune to take a full semester class in Corporate Finance from me in the previous year. However, I do make the assumption that a summer is all you need to wipe out everything you have learned over the previous year and the first three or four weeks of this class provide a quick review of the corporate finance class. But even if you don't have time to do these things, why not just drop by and listen to a lecture or two? This is the central repository for everything to do with the class. Take quizzes/exam: I will post the quizzes on the website, right after I give it in class and the solutions the day after (with grading guidelines). You can take the quizzes/exam and grade yourself (follow the honor code). Valuation project: This class has a big project that is a valuation of a company. You can pick any company and follow along on the project. On this one, unfortunately, I cannot be a full service operation. While I do give feedback to those who are officially in the class, I cannot do the same with everyone who is taking the class unofficially. If you do get stuck on a concept, and I can help, I will try. Enter the code FHGN2P and you will become part of the course online. I will put the emails that I send on here and it will let you raise questions/issues related to valuation that can be discussed. In closing, I hope you do drop by and become part of this experience.... See you in class!